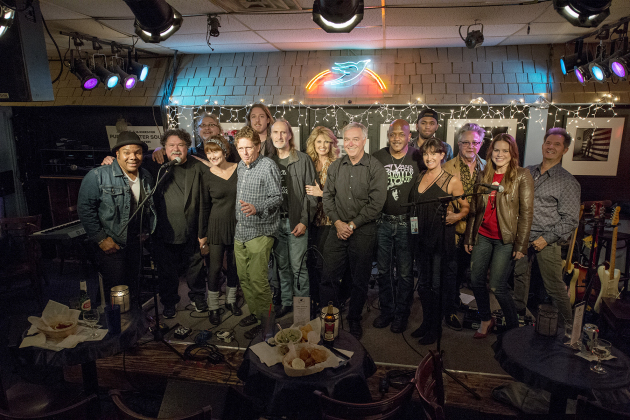 16th Annual Freedom Sings Concert at The Bluebird Cafe. It was a night of heartwarming and sometimes heartrending performances as Mass Comm Dean Ken Paulson’s “Freedom Sings” honored the life of the late Nashville journalist and activist John Seigenthaler. Celebrating its 16th anniversary, “Freedom Sings” brought songs of “truth, justice and equality” to The Bluebird Café in late October to pay homage to a man who fought for social justice and equality. “John understood well that the First Amendment was not just about freedom of the press,” said Paulson, who is also president of the First Amendment Center. “It protects all free expression, including art and music.” Seigenthaler died July 11, 2014, after a distinctive career as long-time editor of The Tennessean and leading advocate of free speech and social justice. Singer/songwriter Michael Kelsh performed solo a haunting rendition of “Ellis Unit One,” Steve Earle’s hit from the Dead Man Walking film soundtrack. The Freedom Sings house “banned” backing the talented lineup included singer/guitarist/songwriter Danny Flowers, songwriter/recording artist Bill Lloyd (also of the country duo Foster & Lloyd), bass player and founding member of the E–Street Band Garry Tallent, Steve Miller Band keyboard player/vocalist Joseph Wooten and up-and-coming drummer/musician Jessie Wooten. The show closed with all performers taking to the stage to sing the timeless rock ‘n’ roll classic “Turn Turn Turn,” written by the legendary Pete Seeger and a No. 1 hit for The Byrds in 1965. Between songs, Paulson introduced to the audience longtime Midstate journalist Pat Embry, the new director of MTSU’s John Seigenthaler Chair of Excellence in First Amendment Studies. MTSU established the Seigenthaler Chair in 1986, and it supports a variety of activities related to free speech, free press rights and other topics of concern for contemporary journalism, including hands-on training for student journalists through the Seigenthaler News Service. Click here to watch the introduction to Freedom Sings at the Bluebird.